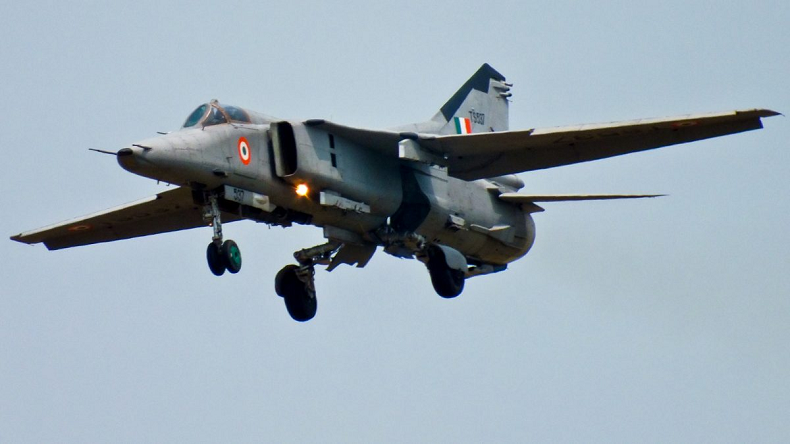 MiG 27 fighter jet crashes in Rajasthan's Pokhran range: According to the reports, a MiG 27 fighter jet crashed in Jaisalmer's Pokhran range in Rajasthan today. MiG 27 crashed at around 6:10 pm but the pilot ejected safely. The India Air Force Court of Inquiry will investigate the cause of the accident, say reports. MiG 27 fighter jet crashes in Rajasthan’s Pokhran range: A MiG 27 fighter jet on Tuesday crashed in Rajasthan’s Jaisalmer. The reports suggest that the pilot safely ejected from the plane before it could hit the ground. The MIG 27 had reportedly taken off from the Jaisalmer Air Force Station and was on a training mission. The reports say that the fighter plane crashed at around 6:10 pm near the Pokhran range. After the incident, the Indian Air Force Court of Inquiry ordered to set up a committee to investigate today’s MiG 27 crash. News agency PTI reported that the MiG 27 crashed in Eta village in Pokaran tehsil of Rajasthan’s Jaisalmer district. Describing the incident, Defence spokesperson Col Sombit Ghosh told media that A MIG 27 aircraft airborne from Jaisalmer crashed during a routine mission today evening. The pilot ejected safely and a Court of Inquiry will investigate the cause of the accident. Earlier in another similar incident, an Indian Air Force MiG 27 fighter jet had crashed near Jodhpur during a routine mission. The pilots managed to take the plane away from the dense residential colonies and the aircraft crashed on an open field. Both the pilot and co-pilot had managed to eject safely from the MiG 27.